TransferPlan will transfer you from and to Kolymvari as quickly, safely and comfortably as possible. Kolymvari, also known as Kolymbari, is a town and former municipality in the Chania regional unit. Kolimbari is 24 km from the city of Chania and 12 km from the large resort of the prefecture of Chania, Platanias, Agia Marina and Kato Stalos. 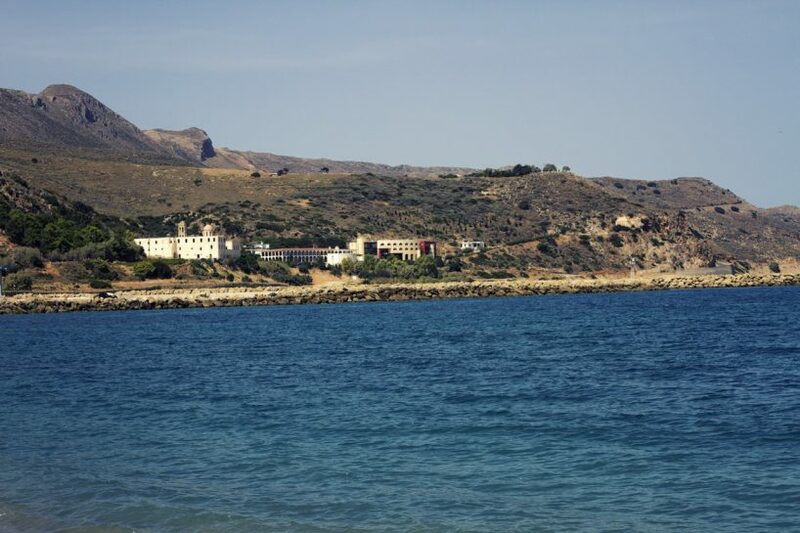 This lovely village is surrounded by the blue sea and by olive groves, making it famous amongst the visitors. Kolymbari has small traditional houses with blue doors and small yards full of colourful flowers. The beaches in the area are sandy and shingle with crystal clear blue water. The village itself is untouched by mass tourism but you will find all basic amenities for tourists, like small restaurants, fish taverns and cafes. The waterfront and the dock of the new harbour, that encloses the oldest small harbour with the fishing boats, is ideal for a walk in the afternoon, overlooking the Aegean Sea on one side and the mountains of Rodopos peninsula on the other. The village of Rodopos itself is famous within Greece for producing the finest tasting honey. You can buy locally brewed wines and Raki here also, the villagers claim it to be the finest in all of Crete, as all locals always do. The sights you also might want to visit is the monastery of Gonia, which dates back to the 13th century and if you arrive within the stated opening hours you can enter the church and admire the paintings and the amazing architecture. There are a few irregular boat trips around this area, and you can visit the beaches of Kissamos and Balos, both within easy reach of Kolymbari. Balos is one of the most beautiful and famous beaches in the world and definitely worth’s a visit. Kolymvari is the perfect place if you want to visit the prefecture of Chania, as it is away from mass tourism and very close to all the points of interest. Either you want to go hiking in Samaria Gorge or trekking in Balos lagoon, this is your perfect base. This traditional village will steal your heart. Book your resort private transfer in Crete now. Enjoy a high-quality service at the lowest prices. Best price guaranteed. That’s why we are Crete’s favourite airport transfer company.